Discover and explore UTRGV School of Music, we are committed to excellence in education, performance, creative activity and to guide students in high achievements and professional success. 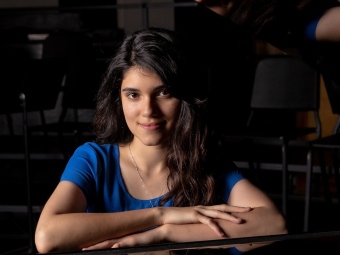 The UTRGV School of Music is led by nationally and internationally recognized professors known for their abilities to uide students to high achievements and professional success. Our students receive national recognition as performers and they become highly skilled teachers. We bring the music of the world here and we introduce the world to our music. 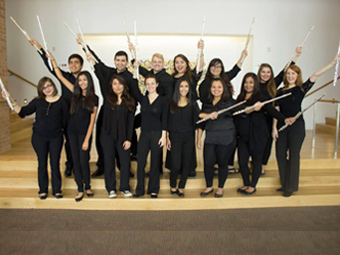 We have outstanding concert halls in Brownsville and Edinburg which give students the real experience of performing in world-class acoustic halls. The SoM offers unique chamber ensembles and we are developing tablet-based music instruction on the leading edge. These experiences are guided by faculty who are UT System Regents Outstanding Teachers and Apple Distinguished Educators. We have programs to engage students in the fabric of the community as musicians and teachers. We create the opportunities for students to explore what music can be, how music is a shared joy and deep expression in all its variety. We are an emerging research university which gives us the incredibly rare chance to seek new ways to create, present, learn, and teach music that lead to the next level. We invite you to be part of that creative process, to contribute to the future and to discover new insights.